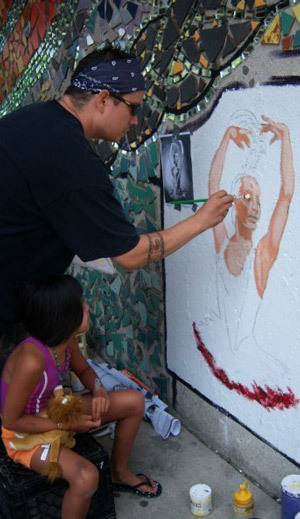 Chris Pappan with daughter Ji Hae working on an image of Maria Tallchief, Indian Land Dancing Mural, 2009. Chris Pappan has just recently returned from the United Kingdom where he and his wife exhibited their work to a receptive audience in the city of Bristol with support from Dr.Max Carocci of the British museum. While the July/August 2014 issue of Native Peoples featured Chris and his art on the newstand version (and the cover of the Santa Fe Indian Market version along with his family). Last year he was also in Australia as one of 4 artists chosen for the Landmarks Fellowship project with the world renowned Tamarind Institute in Albuquerque NM. The fellowship consisted of an arts and cultural exchange with the Yngul people of Northen Australia, and creating lithographs at the Tamarind Institute. Chris is also the winner of the prestigious Discovery Fellowship from the Southwestern Association of Indian Artists (SWAIA) in 2011 and the Heard Muesum’s Best of Class (Paintings, Drawings,) and Best of Division (drawing) at the 52nd Annual Indian Market 2010. A Chicago based artist of Kaw, Osage, Cheyenne River Sioux heritage, he is a self described Native American Lowbrow artist. Currently his artwork is based on American Indian ledger drawings of the mid to late 19th Century while giving them a 21st Century twist. Chris has lived in Chicago for the past 20 yrs with his wife Debra Yepa-Pappan, and their daughter Ji Hae. Chris’ work is in the collections of the Field Museum in Chicago IL; National Museum of the American Indian in Washington D.C.; The James T. Bialac Native American art collection at the Fred Jones Jr. museum of Art in Norman Oklahoma; The North America Native Museum in Zurich Switzerland; The Spencer Museum of Art in Lawrence Kansas, as well as other public and private collections around the world.